Over at Splitcoast today it’s the color challenge. Our colors today…gold, silver and white and for dessert…make an anniversary or wedding card. This card would work for either occasion. I’ve started with a standard 4.25″ x 5.5″ card base in white and added a slightly smaller rectangle that’s been dry embossed. The hearts have been die cut and then sliced with my craft knife so that each piece could be inserted into the next. And to hide the cuts…rhinestones. Then more tiny rhinestones throughout the lattice background. The hearts have been popped up on dimensionals. The sentiment is simply stamped on vellum and then I used a square punch to form the banner shape. Actually a very quick card to put together. That’s it for today my friends…see you soon with more! LOVE that EF you used in the BG!! Lovely touches with the bling. OMGoodness – How brilliant is that!!??!! To add a sentiment in vellum. 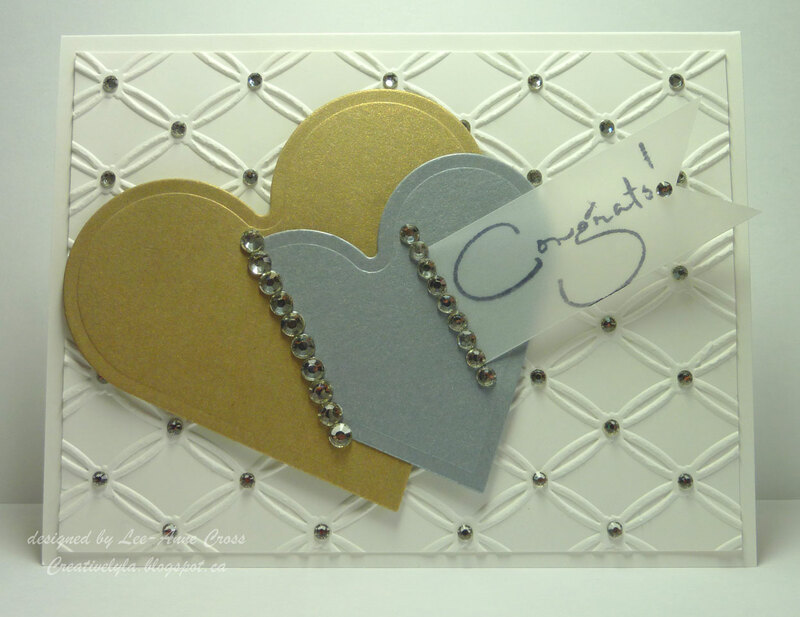 I love that idea and I love your card – very pretty. Previous Previous post: Its Always Been You! Next Next post: Vintage Thank You!